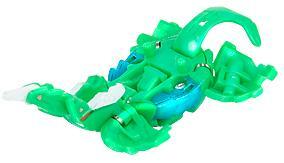 Megarus is an unreleased Bakugan. Its ball form looks similar to Moskeeto. It looks like a Swordfish/Dolphin in real mode. Akwimos called an army of Megarus, "Big Sardines" in episode 24. It is in the BakuSuper G series. Aquos has 950 Gs.Ventus has 1100 Gs. It is also available in Pyrus. It will be released in November/December. Purchase your Megarus from Amazon now!